Pokémon Base Set was the first set of Pokémon TCG cards released in the United States. These cards were printed by Wizards of the Coast (the makers of Magic: the Gathering). The first print run of a set would have a special “Edition 1” logo on the left side of the card, just below the card art. The 1st edition would typically be very limited, and once sold out, would no longer be available. To meet demand though, an “Unlimited” edition version would then be printed. Unlimited edition cards don’t have the “Edition 1” logo on the left side. What makes some of these early Pokémon cards difficult to tell apart is the large number of printings that were made, as well as the subtle differences from print run to print run. Collectors will value the rarer print runs higher than the commonly available ones. Typically, a 1st edition card (as differentiated by the “Edition 1” logo shown above) will be worth more than a non-1st edition card. Sometimes this price difference can be significant. To add further confusion, the “1st Edition” (Limited print run) of base set actually had two different printings, the second of which did not have the “Edition 1” logo. 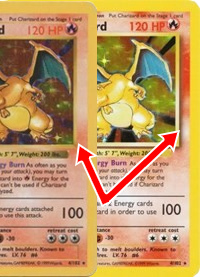 Both “Limited Editions” were “shadowless”—that is, there was no drop shadow underneath the art box on the right side of the card (note that shadows were only ever used on Pokémon themselves—trainer cards did not ever have shadows). 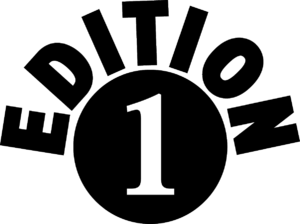 However, usually only the 2nd printing is referred to as “shadowless,” as it is easier to differentiate the 1st printing by its “Edition 1” logo. The image below shows a shadowless (left) and shadowed (right) card side-by-side. The shadow appears behind the art. 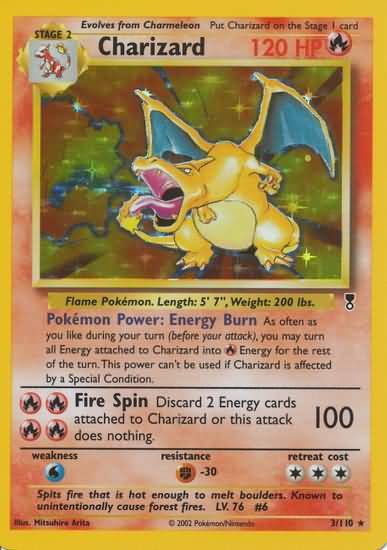 The examples below all utilize Charizard, which fetches the highest prices of any Pokémon from these early sets. Those looking to sell their collections should not expect Charizard-level pricing for other cards from these sets. 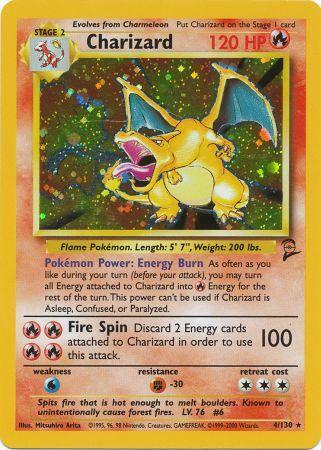 While other Pokémon, like Blastoise and Venusaur, carry some value, none approach the level of Charizard. See this page for more information on identifying the Machamp card from this era. The pricing examples all note that the estimated pricing reflects a card in Near Mint condition. Finding cards from this era in Near Mint condition can be quite difficult. Pokémon cards are essentially pieces of a game, and many became treasured possessions of children who took them to school in their pockets to show off and trade. As a result, cards frequently show significant wear, which deeply affects their value. Unless exclusively stored in binders and played with in card sleeves (which was virtually unknown at the time), there are few Near Mint examples in circulation. In addition, cards that came from a household with heavy cigarette smoke, or that were stored in a damp attic or garage in the intervening years, can have a lowered value, even if the card physically appears otherwise Near Mint. These cards are the most valuable of the Base Set print runs. This 1st print run was printed, distributed, and sold before “Pokémania” fully took root in the United States, making them extremely rare today, particularly in Near Mint condition. Collectors who do own these cards will typically have them authenticated and graded by a grading service such as Beckett Grading Services (BGS) or Professional Sports Authenticator (PSA). These cards, graded or ungraded, if authentic, can carry significant value. 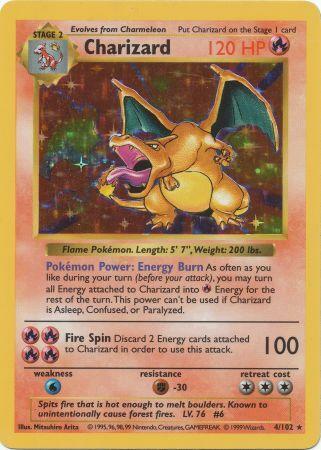 For example, the above Charizard card could be worth around $700 to a collector in perfect condition. If you are selling it to a store though, expect a much lower price. The copyright line reads “© 1995, 96, 98, 99 Nintendo, Creatures, GAMEFREAK. © 1999 Wizards.” Interestingly, the later Unlimited print run omits the ’99’ year in the copyright. This copyright line is important to identify trainer cards from this print run, as only actual Pokémon had drop shadows in later printings. More common than the true 1st edition, Shadowless cards are still quite rare compared to Unlimited edition. A Charizard from this printing could have a retail value of up to $75 in near mint condition. Again, stores will pay less than this. There were reportedly six separate printings of the Unlimited Edition of the Base Set. The first five print runs had a copyright line that read: “© 1995, 96, 98 Nintendo, Creatures, GAMEFREAK. ©1999 Wizards.”. These five print runs are completely identical, with no way to differentiate between them. The final print run, which was only available in the United Kingdom, can be differentiated by a change to the copyright line which reads, ” ©1995, 96, 98 Nintendo, Creatures, GAMEFREAK. ©1999-2000 Wizards.” Cards from the sixth print run are much rarer due to their limited geographical distribution. Unlimited Edition made a number of aesthetic changes to the face of the cards. The overall card appears to be a lighter and brighter printing than the previous Limited Editions. The drop shadow was added behind the art box to add some depth to the card. In addition, certain text, such as the Pokémon’s HP value, was set in a bold typeface. With five to six printings, these cards are by far the most common Base Set cards in existence, and their prices reflect that. Unlimited Edition was printed to meet the insane demand of a public that became obsessed with Pokémon. A Charizard from these printings would fetch about $35 in Near Mint condition from a collector. Expect to receive much less than that if you are selling your copy to a store. In early 2000, Wizards of the Coast released the fairly unpopular Base Set 2, which was a combination of a number of cards from the original Base Set and the Jungle expansion. This brought the number of cards in the set up to 130 from Base Set’s original 102. Base Set 2, being a reprint set, was never printed in a “1st Edition” configuration with the “Edition 1” logo on the left. 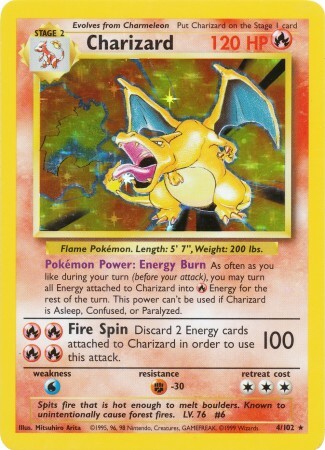 Base Set 2, unlike the original Base Set had a set symbol logo on the right side—a stylized 2 with a pokéball on top of it (see the bottom right corner of the Charizard artwork in the card below). Base Set 2 Charizards are priced very similarly to Base Set Unlimited printings. A Base Set 2 Charizard has a retail value of about $35 in Near Mint condition. In May 2002, Wizards of the Coast released their next reprint set, Legendary Collection. It is believed that this set was not called Base Set 3 due to the massive unpopularity of Base Set 2. However, Legendary Collection went on to become one of the most popular Pokémon sets of that era. Legendary Collection reprinted 110 cards from the Base Set, Jungle, Fossil, and Team Rocket expansions, and even included a card that was previously only available as a promotional card (Mewtwo). There were two versions of Charizard in this set. One looks similar to all of the other previous printings of Charizard, but carries the number 3/110 and the Legendary Collection set symbol. The second was a new concept in Pokémon—the Reverse Holo card. Holographic cards only have a holographic art image whereas a reverse holo card will have holographic foiling on the rest of the card while the artwork is not holographic. The reverse holographic cards in this set had a starburst refraction pattern. The second image below is a scan, so the starburst pattern is obvious. The actual cards do not look blue. 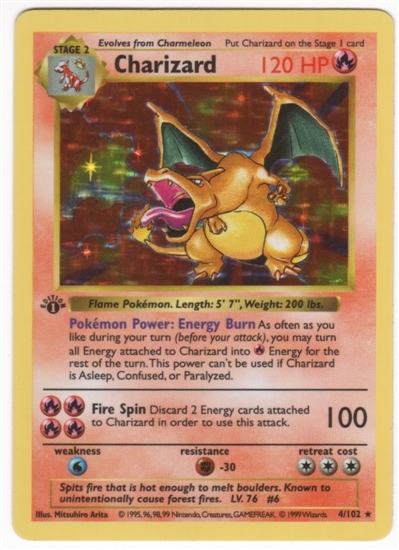 The standard Legendary Collection Charizard is worth around $30 retail for a Near Mint copy, while the reverse holo version can fetch slightly upwards of $100. 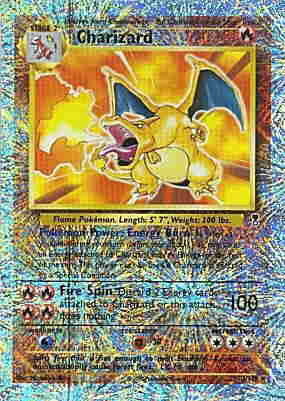 For more information on early Pokémon cards, check out our page about Machamp.